Obituary – Ewy, Margie June (Moran) « Perry High School Alumni Association, Inc.
Margie J. Ewy, 86, passed peacefully into eternal life on Sunday, April 23, 2017 at Green Valley Nursing Home in Perry. Arrangements have been entrusted to Palmer Marler Funeral Home in Perry. Funeral services are scheduled for 2PM Thursday, April 27, 2017 at Christ Lutheran Church in Perry. Pastor William Metz will officiate. Interment will follow at Zion Lutheran Cemetery. Visitation will be 9AM to 8PM Wednesday, April 26, 2017 at Palmer Marler Funeral Home. Family will receive guests from 6PM to 8PM. Pallbearers will be former Christ Lutheran School teachers, also known as the “Fantastic Five”, Galen Dohrman, Bill DeJager, Gary Beckman, and Dave Mueller; also, Jeff Meyer, and her nephew, Robert Peetoom, will serve as well. Nephews, Richard Ingmire, Ron Clinton and Vince Shoop will serve as honorary pallbearers. Margie was born July 10, 1930 in Oklahoma City, OK, at the Home of Redeeming Love to Ethel Green (her biological mother), and within a few months, became the beloved child of Frank Nicholas and Ethel (Story) Moran. Her early years were spent in Mulhall-Orlando. She then moved to Perry with her parents to a home near the Christ Lutheran Church, which she believed was a special blessing. 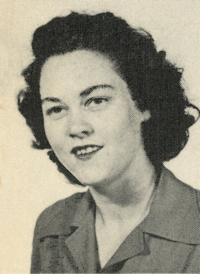 She attended Perry Public Schools later and graduated from PHS in 1948. On December 24, 1948, she and Bobby Lee Ewy were united in marriage in Perry, OK. They celebrated their 68th wedding anniversary in 2016. Their marriage was blessed with two children, Patty Bible and Mike Ewy, both of Perry. Margie began teaching Kindergarten in 1957 at Christ Lutheran School and continued teaching there for 27 more years. She touched countless young lives and many students remember her as their “favorite” Kindergarten teacher. She also served as secretary and bookkeeper for her husband’s construction company for many years. 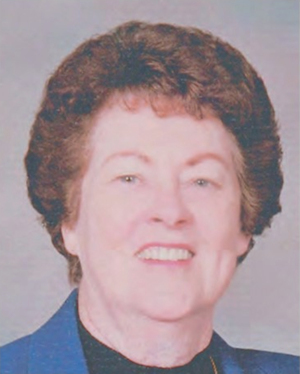 She was a long-time member at Christ Lutheran Church. Teaching Sunday School, Vacation Bible School, and serving with LWML and Unit. She also enjoyed regular “club” meetings with her friends in the Tuesday Afternoon Club, which sometimes met on Thursdays. In 1989, Margie discovered she was not an only child, and was thrilled to find two brothers and a sister living in California. She was a dog lover, avid bird watcher, game and card player, crossword puzzle lover, video poker player, cobolt blue glass collector, and home entertainer. She loved to travel and was ready to “go” on a moment’s notice. Her sharp wit, curiosity, humor and love of family and friend gatherings will be dearly missed but forever remembered by those who loved her. She is survived by her husband Bobby Lee “Bob” of the home; daughter, Patty Bible and husband H.E. ; son, Bobby Michael “Mike” Ewy and wife Carrie, all of Perry, OK; four grandchildren, Stacy Wilson and husband Bryan, Megan Meyer and husband Jeff, Jessican Freeman and Fiance’ Matt Kelley, and Jason DeVilbiss and wife Allison; great-grandchildren, Jaden Oakes, Zoe Freeman, Harper DeVilbiss, and Teaguen, Brylie, and Cami Wilson; brother, Dwight Trammell of Modesto, CA; sister, Betty Blagg of Waterford, CA; and very special nieces and nephews on both sides of the family. Margie was predeceased by her parents, three brothers, and her fur babies, Skippy, Missy, Duffer, Tigger, and Keeley. The family is deeply grateful to all those who helped care for Margie, especially Dr. Michael Hartwig, the staff at Perry Green Valley, and Torrie Halbert of Companion Hospice. Memorials may be sent to Christ Lutheran Church or Perry Humane Society in c/o of Palmer Marler Funeral Home, P.O. Box 189, Perry, OK, 73077.